10/3 College Application Workshop for Seniors & Parents 6:30p.m. 10/10 Collaboration Day, early release at 1:48p.m. 10/16 Tri-Valley College Fair, Granada H.S. 10/17 Counseling Parent Night 9-11 grades 6:30p.m. 10/20 Irish Guard Field Show, Stadium 4p.m. 10/24 Collaboration Day Early release at 1:48p.m. The 5th-Annual “Raise Your Class” Gaela will be held on Saturday, November 3rd at the San Ramon Golf Club at 6:00 p.m. Come join us for an adult evening that will include appetizers, buffet dinner, no-host bar, as well as dancing. There will also be silent, live, and dessert auctions plus lots of great raffle items! Tickets are on sale until 10/21 for $55 per person. To purchase tickets, visit the online store at http://www.dublinhighpfso.com/PFSO-STORE.html. Tickets can also be purchased on Fridays at lunch where the movie tickets are sold (in front of Student Activities). This event will take place on Wednesday, October 3rd. Workshops will be at 6:30 p.m., 7:10 p.m.and 7:50 pm. CSU Workshop with Talvin Sodhi and Gloria DaSilva in Room J104. UC Workshop with Kim Halket in the Library. The Common Application Workshop with Caroline Rubio in Room L104. Attend one, two, or all three sessions depending on your college plans. Attention Freshman, Sophomore and Junior Parents: Don’t Miss Parent Night! Please mark your calendars for Parents’ Night with the counselors on Wed., Oct. 17 at 6:30p.m. in the Little Theatre. Students are welcome. The counselors will go over SAT/ACT information, college applications, career pathways and college options. They will also review updates from the CSU and UC systems regarding impaction and college admission. Students will no longer need to list their classes and calculate their GPA on the application form. Students will now simply list their report card or transcript GPA. All classes count. Students with more than 8 tardies will be disqualified (unless special circumstances which require the clearance of an Assistant Principal). Students still need to verify their attendance. A voluntary $5 donation will be requested to defray program costs. Students not attending Awards Night will be responsible for picking up their awards within 2 weeks. The Lamp Pin will be awarded once after the student earns the Block D. Receiving the Lamp Pin is the final award in the program. What is Academic “Block D”? 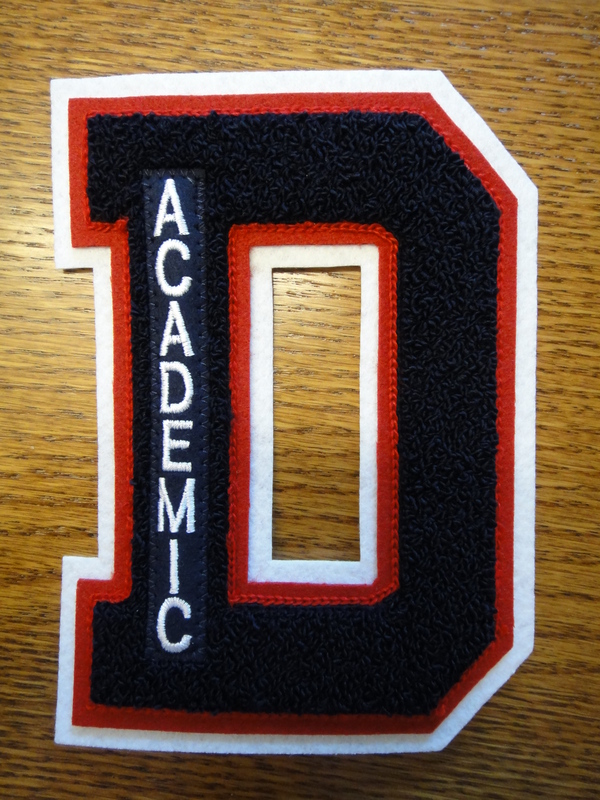 The Academic Block program is designated to acknowledge academic success. Students interested in obtaining an Academic Block must apply, much like the athlete that must try out and participate in a sport to receive an Athletic Block. Each semester, students with a high school grade point average (GPA) of 3.5 for three (3) consecutive semesters or five (5) total semesters, may apply for this award program. Students who have less than a 3.5 GPA but are taking Honors or Advanced Placement courses may also be eligible, as they receive one extra grade point for each course. Students submitting an application may not have a confirmed cut, a suspension, or have been dropped from a class by a teacher for disciplinary or attendance reasons. Students wishing to apply for Academic Block D should complete an application for each semester that they are eligible. Applications are accepted during the first 12 days of OCTOBER for the previous spring semester, and the beginning of FEBRUARY for the current fall semester. Late applications are not accepted. If you submit a qualifying application, you will receive an invitation by mail to attend the Annual Awards Celebration, held in the spring. AWARDS: You will receive a CERTIFICATE OF ACCOMPLISHMENT upon acceptance of your first application. You will receive a CERTIFICATE OF COMMENDATION upon acceptance of your second application, also, your third and fourth application should your 3.5 GPA not be in consecutive semesters. You will receive an ACADEMIC LETTER upon acceptance of your third (3rd) consecutive semester or fifth (5th) non-consecutive semesters. For all accepted applications after the third (3rd) consecutive or fifth (5th) non-consecutive semester, you will receive an “Honor” pin. DHS Drama will be presenting Williams Inge’s “Picnic” for a three-night and one-day run this month, Thursday October 25 through Sunday, October 28. Thursday, Friday and Saturday the curtain will rise at 7:00p.m. Sunday is a 2 p.m. matinee showing. Tickets are $10 for adults, $7 for students. For more information please visit www.DHSDrama.org. Mark Your Calendar: Dublin High PFSO will host a School Board Candidates’ Forum on Tuesday, Oct. 22 at 7:30 p.m. in the library. The Forum will follow our monthly PFSO meeting, which will start at the special time of 6:30 p.m. We would love a large crowd to hear the candidates speak to the issues that are important to you! We are rolling with our new fundraiser, Bond Rewards! We have nearly 150 families signed up and earning money for Dublin High and we are appreciative of the very valuable help. Bond Rewards serves as a portal to many online shopping sites and we you buy, we earn. The best part is, you earn as well, banking cash rewards. In addition, there is a Donation button on the site that will take you directly to groups at Dublin High who are working toward specific funding goals an you can make a straight donation to their cause. Right now, the Robotics club is on our Donation site, looking to raise money for their trip to the World Championships. Go to www.dublinhsrewards.com, register for a login and pitch in! Stay tuned for the upcoming video network as well as Daily Deals! The Career Center maintains its own website on the Dublin High website. Look for it under Departments. The current college list is posted on the website calendar. We are still adding colleges to the list. The website also posts a current scholarship list and tips for filling out scholarship applications. SAT and ACT information is available in the Career Center. If your student is looking for a job, there are current openings posted on the Job Board. Once your student gets a job, their work permit is issued through the Career Center. *Regal movie tickets will be on sale every Friday (except homecoming week) in front of Student Activities at lunch. Ticket prices are $7.50 per ticket for non pass-restricted movies. Parents who want to buy tickets in bulk can contact 828-7060 or email Cyber Stacey at dublinhighpfso@dublinhighpfso.com to make arrangements. This fundraiser benefits the Class of 2014. The store is located inside Student Activities with items available for purchase each day during school hours. Come cheer on our Irish Guard in the Gael Stadium on Saturday, October 20th. Gates open at 1p.m. with the competition starting at 4p.m. Admission is $10. There will be 16 bands from near and far competing.